(Phoenix, AZ. March 24, 2011) – Many of us may not even think about how water comes through our pipes each day, but underground pipes are a necessity to pass that water from its source to our kitchens and bathrooms and from there, away. With the billions of gallons of water flowing through those pipes on a daily basis, it’s not surprising that corrosion can occur. Infra-Tect has created a new HDPE beveled edge that not only eliminates corrosion but also adheres to OSHA standards and reduces workers’ compensation claims. 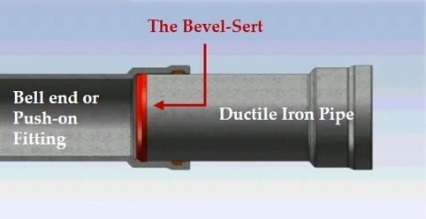 The Bevel-Sert is a beveled edge that helps connect two underground ductile iron or PVC pipes. It’s that simple. What this little HDPE ring does, however, is profound. Currently, most construction workers are using a cut-off saw to cut the pipe and then, with the same saw, grind a bevel onto the cut pipe in order to connect them. However, OSHA clearly prohibits this behavior due to the safety implications to the workers who are using the tools incorrectly. Without the Bevel-Sert, corrosion issues abound in metal pipes. That corrosion can lead to a shorter life span for the pipes, which in result leads to increased costs for municipalities as they need to replace these pipes more often. Corrosion also translates to millions of gallons of wasted water-one of our most precious resources. Depending on location, replacement of an eight-inch water main can be as high as $180 per foot. The simple investment in the Bevel-Sert drastically cuts installation and serviceable life costs in the long run. This entry was posted in Phoenix, Arizona on March 24, 2011 by admin1.